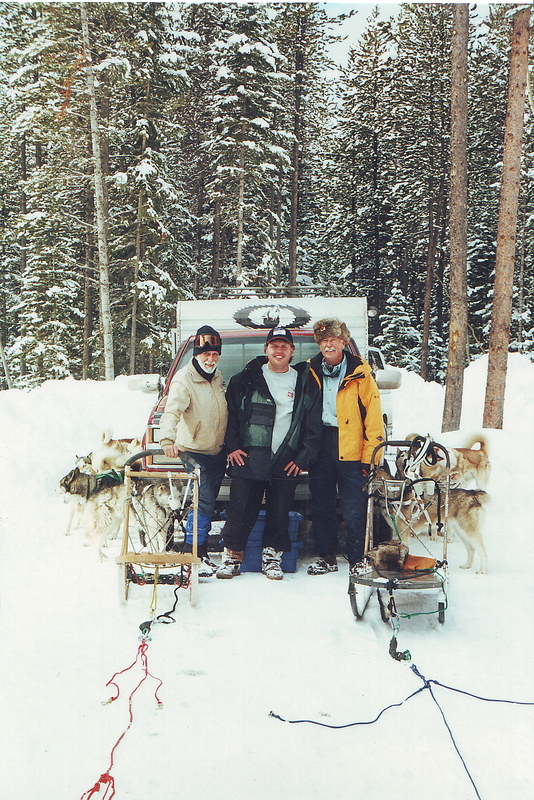 About three weeks ago, Robert “Mac” McClanahan gave us a call and said that he received a copy of The Gangline and wanted to learn how to run sled dogs. Mac McClanahan is 82 years old and full of life. 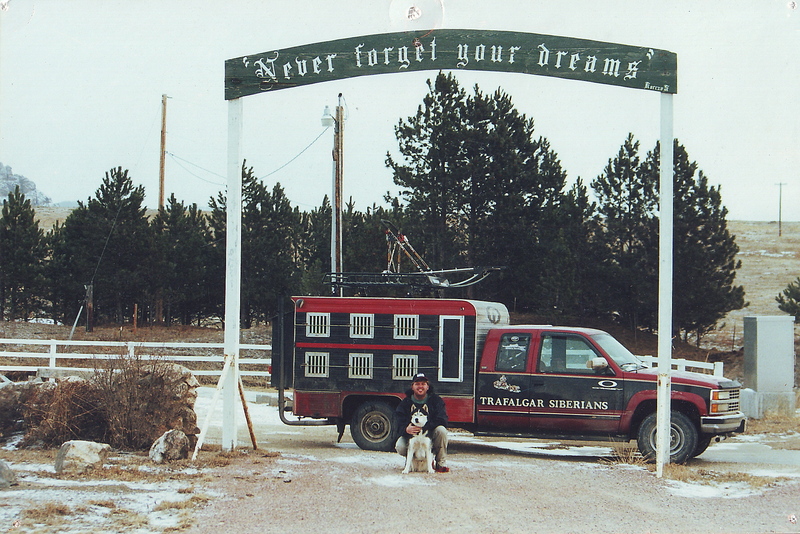 He said that he has done just about everything; flew helicopters in the Korean War, forced landed three planes, paraglide, walked the Colorado trail, but nothing compares to being behind a team of dogs. Mac said it was one of the most emotional times of his life the first time he was behind a team of dogs and that was just a mere two weeks ago. Mac was looking for a dog last year that could meet some pretty rigid requirements. After months of research and reams of paper on the internet, he and his wife Melba, decided on a Siberian Husky. They put their plan into action and happened to find exactly what they were looking for. They found a female, open faced, gray, with blue eyes that had the build of a sled dogs, according to all of the books that Mac had read. Why a female? On Melba’s insistence, she said that you can’t get smarter than a woman and if you wanted a lead dog you needed a female. They must have made the right choice because it just so happens that the dog that they picked is a sister to one of our sled dogs here at Team Ineka, Nixon. Mac’s goal is to run with some of Team Ineka’s dogs this year in a race or two with a team of three or four dogs. He is working very hard on his training and he and his dog are doing great. Right now they come over for a “session” twice a week and we try to teach something new each time. He is learning quickly. He has been dragged, had a dog fight with a dog on the trail, and even gotten lost when his team took off too fast for me to catch him with my team. We talked about the future of the sport and what he thought about the Iditarod and he said he thinks the future is very bright. Mac said that this is a “word of mouth” sport and he will do his best to promote it. He said that he has lived in Colorado for seven years and has seen lots of dog trucks driving around but nothing else. He said that needs to change. There needs to be more advertising in local papers and different forms of media. Mac said that he is telling everyone that he talks to that he is running sled dogs. When he does everyone stops, their ears perk up, and they want to know more and more. That is what this sport needs. More ambitious people like Mac. His spirit keeps me motivated and all I want to do is train and train. Well, we are going to try our best to make that dream happen for Mac and Chukchi, she is a natural in harness and will be running in races this year. I have already promised him that. What a great time to be in Alaska. The leaves are changing and the air is getting cooler. The nights are just a little longer and the mist in the wind refreshes your soul. Last night was a great day to run dogs. I helped out a couple new friends that are premiere Siberian Husky racers and I was privileged to go along while they trained three teams of 16 dogs. The dogs were remarkable. Probably the best trained Siberians I have ever seen in my life. Their leaders on all three teams responded quickly and turned on a dime. Many people train dogs for years to get their leaders to respond that well. I arrived home about 12:15 with hopes of getting a first glimpse of the Aurora Borealis but it is still early yet and according to the forecasters as it a little north near Fairbanks. The aurora is actually the glow of solar particles blown into the earth’s magnetic field more than 60 miles above the earth’s surface at speeds up to 35,000 miles per hour. The streams of charged solar particles surge and bulge along bends in the earth’s magnetic field. As they strike atoms in the earth’s atmosphere, they create greenish-yellow, faint blue, or even blood red curtains of color. With such a dramatic show of force in the sky, it’s easy to see how some Alaska Native groups believed the lights had serious powers. Some believed the lights were the dancing spirits of children who died at birth. Others thought them spirits of the dead playing ball with a walrus skull. 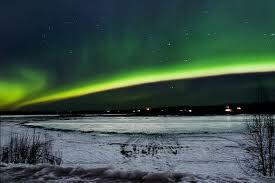 Some believed that whistling at the aurora would cause it to sweep down and take you from earth. Still others carried knives to keep it away.